As a photographer, I'm strongly attracted to sharing and revealing the parts of life I think are meaningful and important. I am inspired by humanity's resilience, brilliance, and character; especially when cast in the light of our frailty. 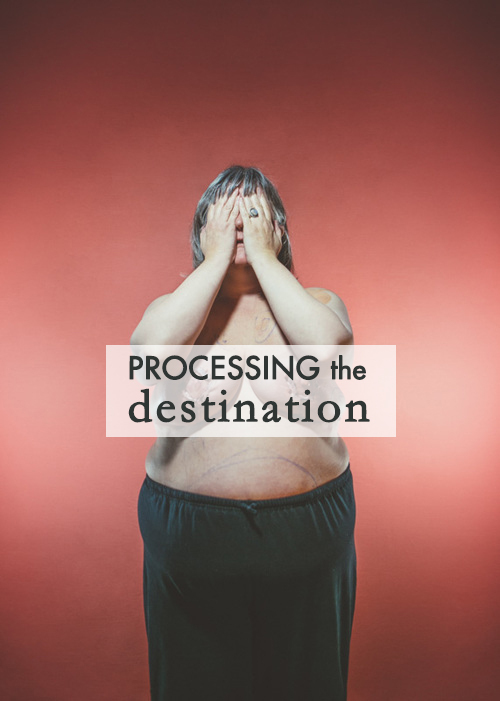 Processing the Destination documents the progression of one woman's life over two difficult years as she undergoes a double mastectomy and breast reconstruction surgery. It invites the viewer into the process by sharing an increasingly common experience that is usually private, personal, and often goes unseen. Using nothing but a peach backdrop, the color of the original breast cancer ribbon, Processing the Destination explores the notion of bodily invasion and loss, of absence and reconstruction, and of the rebuilding of something broken into something strong. These pictures also tell a story of the relationship between motherhood and the female body, where the 'before and after' images of mother and child represent the extent of time and change that has taken place. My subject was inspired to capture this period in her life because, when she first discovered she would need the procedure, she saw very little imagery that depicted the reality of what her surgeries would encompass. She found it difficult to find pictures of women with her body type. She felt alone. There were lots of 'before and after' images, but a journey is more than just the beginning and the end of something. It became clear that a project that focused on the scale of the process was necessary. Breast cancer is frightening and strikes at the core of womanhood. We wanted to de-mystify the experience, reveal the journey, and add another type of face to expand the narrative. We wanted to enlighten people who aren't dealing with this issue and to help those who are know that they are not alone. Processing the Destination, like my past work, revolves around the human condition. It is an act of empathy and understanding. In this way we can all share in the fear, pain, frustration and subsequent triumph, another fellow human being experienced.